APRIL 1, 2019 — Our Post-Release Monitoring (PRM) team from Camp Lesik, in the northern part of the Kehje Sewen Forest, had not observed Sayang and her new baby for quite some time. So, the team made plans to conduct a special patrol in search of this mother-infant pair, but then by chance happened upon them while observing another released orangutan. The team had tracked and located Robert, a young male who was released in April 2017, when they discovered that he was foraging nearby two other orangutans along the main track of a transect – Sayang and her baby! Read also: A Surprise for Our PRM Team in Camp Lesik! 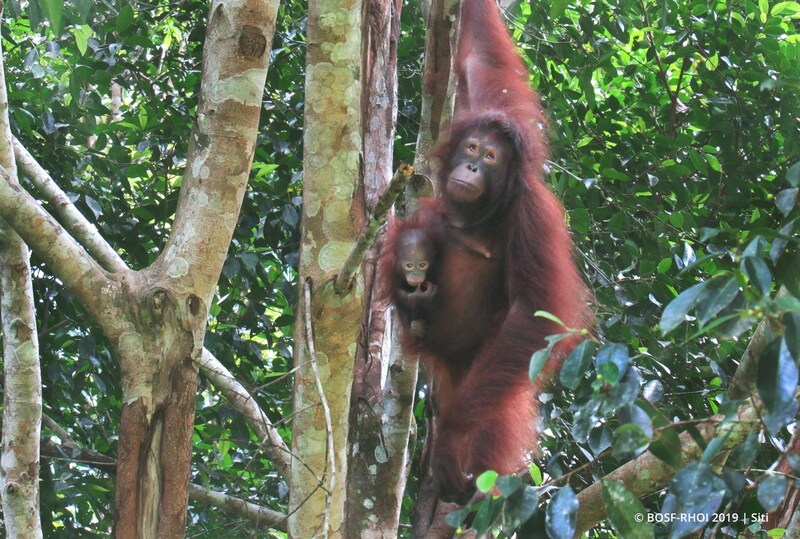 During observations, Sayang and her baby actively moved around the trees and foraged. 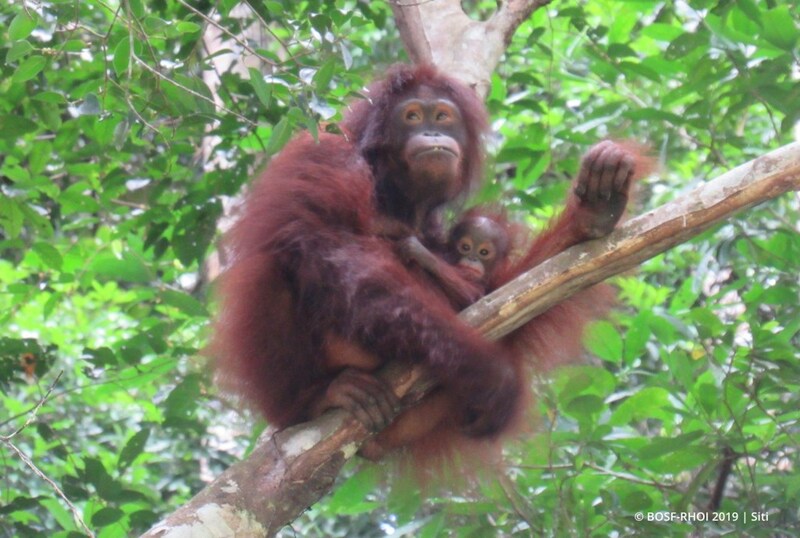 The baby, still less than a year old, looked healthy and breastfed frequently while clinging tightly to Sayang’s belly. Meanwhile, Robert hung back a few meters away. Full of curiosity, he tried several times to approach Sayang and her baby. Robert appeared to be deeply interested in Sayang, and followed her wherever she went. Sayang did not seem to mind; however, she kept her distance from him and focused her attention on her breastfeeding baby. But Robert was persistent, and continued to inch closer. By noon, his efforts had paid off, when Sayang finally let him sit next to her, and shared food. 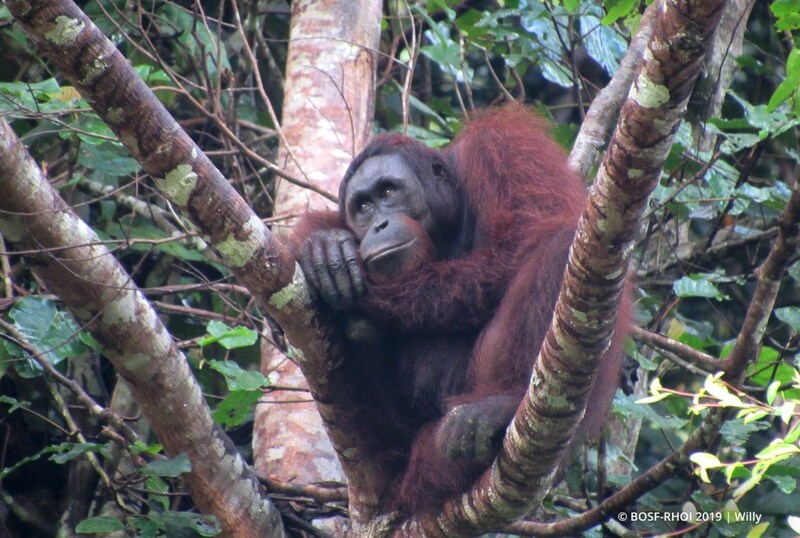 Robert was initially released in the southern part of Kehje Sewen, near Nles Mamse Camp, but proved that he was an avid traveller after being observed interacting with other orangutans in the north not long afterwards. Perhaps Robert’s friendly, calm nature has helped him become easily accepted by others; Sayang included. We believe that Robert and Sayang were only being friendly, and are not mating, since Sayang is still caring for a small baby. We predict that they will spend several days together learning from each other, before separating and moving off to explore the forest on their own. A late afternoon shower accompanied by strong winds was nature’s way of telling the PRM team it was time to wrap up observations for the day, and head back to camp. We did not get to see Sayang and Robert build their evening nests that day, but we sincerely hope these two adolescents will remain good friends in the Kehje Sewen Forest. Please make a donation to the Borneo Orangutan Survival Foundation today!